Contents: 1. General Topics/A Parthasarathy. 2. Diagnosis and Management/Ritabrata Kundu. 3. Common Systemic Infections/Jaydeep Choudhury. 4. Common Bacterial Infections/Abhay K Shah. 5. Common Viral Infections/Digant D Shastri. 6. Protozoal, Parasitic and Fungal Infections/Kheya Ghosh Uttam. 7. Emerging Infections/Vijay N Yewale. 8. IAP Guidelines/Protocols/TU Sukumaran. 9. Vaccines and Immunization/Rohit Agrawal. 10. Miscellaneous Topics/Sailesh Gupta. Annexures. Index. The new edition of this comprehensive book provides clinicians with the latest advances in the diagnosis and management of paediatric infectious diseases. Divided into ten chapters, the text begins with discussion on general topics relating to infectious diseases, and diagnosis and management. Each of the following chapters covers a different type of infection - systemic, bacterial, viral, protozoal, parasitic and fungal; and emerging infections. The increasing concern of resistance to treatment is discussed in depth, as are infections in immune compromised patients, guidelines and protocols, and vaccines and immunisation. The second edition of this detailed reference is highly illustrated with clinical photographs, diagrams, boxes and tables. The book concludes with appendices on intravenous fluid therapy and drug dosage. 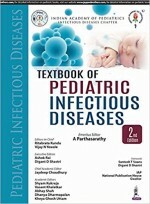 Key points Fully revised, second edition providing latest advances in paediatric infectious diseases Covers numerous common and more complicated infections Includes appendices on intravenous fluid therapy and drug dosage.